GroVia BioSoakers are the perfect solution for cloth diapering on the go. Use when on holiday, at day care, or running errands. 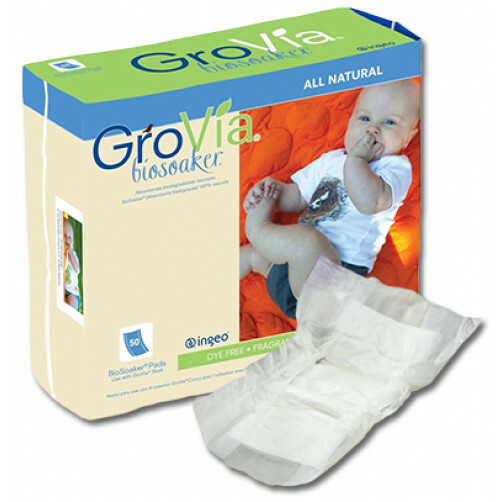 GroVia BioSoakers are simply laid down flat, as the top most layer, directly against the skin. When it's time to change... simply throw away the BioSoaker and let nature take care of the rest. 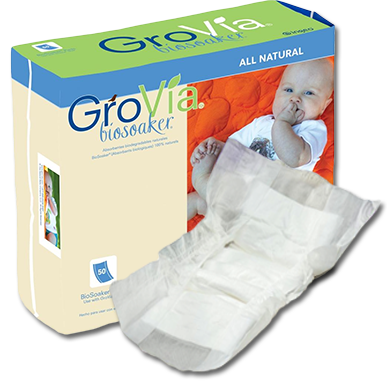 Simply lay/spread your BioSoaker® in your GroVia® Shell or favorite diaper cover and fasten on baby. Use sticky tabs to adhere to cotton underwear as trainers! Lining: Certified natural, 100% Ingeo spun bound non-woven fabric. Compostable to EN13432 (EU) standard and ASTM D 6400 (USA). Core: Sustainably harvested wood pulp fibers, containing a minimal amount of SAP gel. Waterproof Outer: Bio-film (fecula) is waterproof and 100% natural.